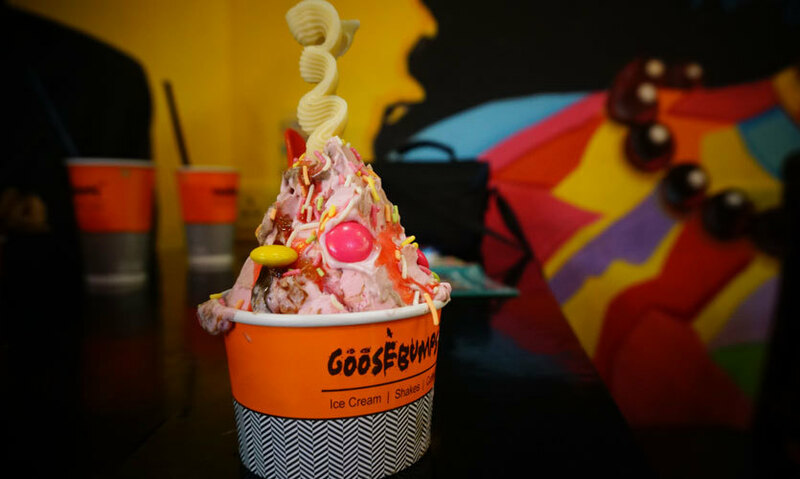 #FoodReview: All Dessert Lovers Head To Goosebumps, Karkardooma For An Ice-Cream Overdose! Dessert hogging will never be the same once you’ve visited this kickass dessert parlour and cafe in the Karkardooma neighbourhood of East Delhi. 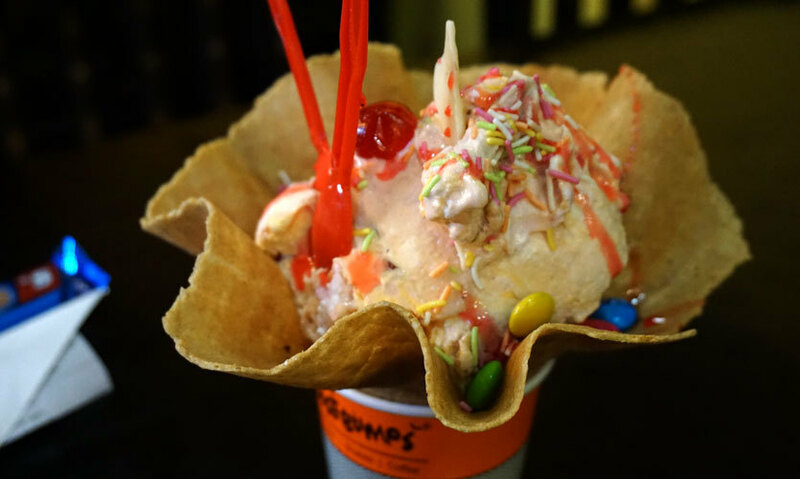 With the most original and inventive flavours of ice-cream, coupled with the most distinct presentation, any and everything they have on the menu will blow your mind! 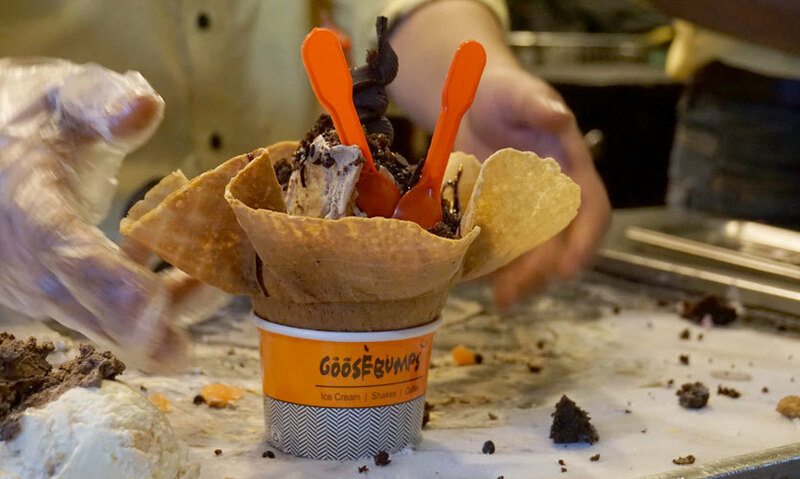 Serving their ice-creams in a wrap-styled wide waffle cone with a small cup base, the folks over at Goosebumps sure know a thing or two about food aesthetics. Not only are they creative with the presentation, but also the preparation. They make the ice cream in the most fascinating manner that’ll make for a pretty fun Snap story. 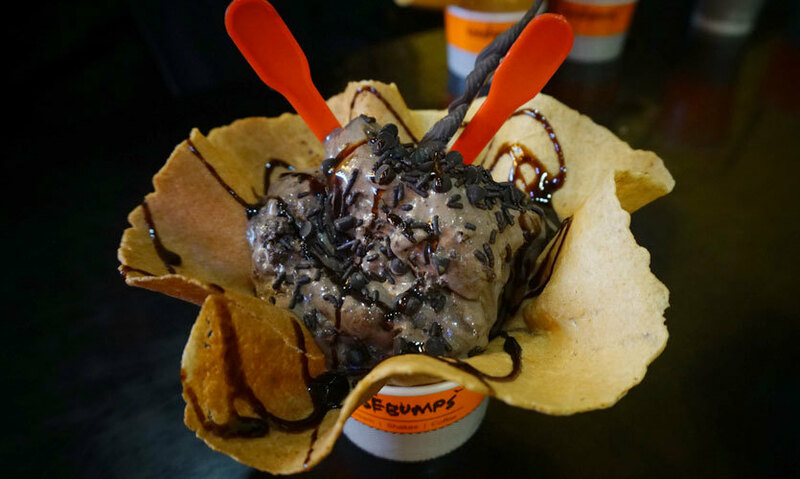 Offering all sorts of funky combinations of ice-creams, their main speciality is their creativity with chocolate ice-cream. And it’s not just the variety, but the thematic choice of our favourite dessert, which they serve under Donut Concept, Nutty Concept, Kids Concept, and Make-Your-Own Concept. Isn’t that something, now? 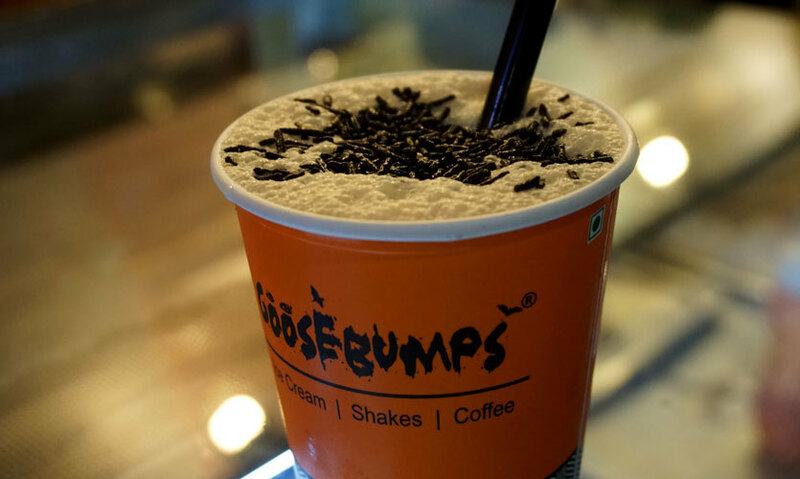 Goosebumps is a full-fledged confectionery who, although they're known for their ice-creams, also offer the most toothsome variety of cakes, pastries, tarts, patties and breads. It’s a sizeable two-floor establishment with a terrace option as well. Here are our top picks from this joint! This one belongs to the 'House of Fruit' concept. Three scoops of multi-flavoured ice cream blended, mashed and mixed with some exotic fruit toppings makes for their regular Fruit Exotica. And in every scoop you take, you can feel the varied flavours in your mouth - that in a waffle cone is an absolute delight! As the name might suggest, the Willy Wonka ice cream belongs to the 'Chocolate Concept' (yes they’ve an entire concept based on chocolate!). The Willy Wonka was the queen of all chocolate ice creams for us and we’ll tell you why. Two scoops of chocolate ice cream mixed with choco flakes, chocolate pastry, drink choco and topped with a choco stick! This must be the maximum number of times choco/chocolate has been used in a single sentence. We won’t even say how crazy it was, 'coz you have to try it for yourself! The Coffee Craze ice cream also belongs to the 'House of Chocolate' concept. It’s a big concept, you see. This one is a scoop of coffee chocolate ice cream mixed with brownies, almond and fudge, which as you know, results in pure indulgence! One great thing about Coffee Craze is how the thick taste of coffee is not lost in between brownies and fudge, and goes deliciously with chocolate *starry eyed*. While carefreely indulging in the above mentioned sweet yummies, we didn’t realise how full we were! So next we decided to have a single scoop of French Strawberry which came across as something new for us. It’s a delightful flavour with an added zing to the regular strawberry ice cream, and is worth trying when you’ve had a heavy dinner, and want something light and fruity. 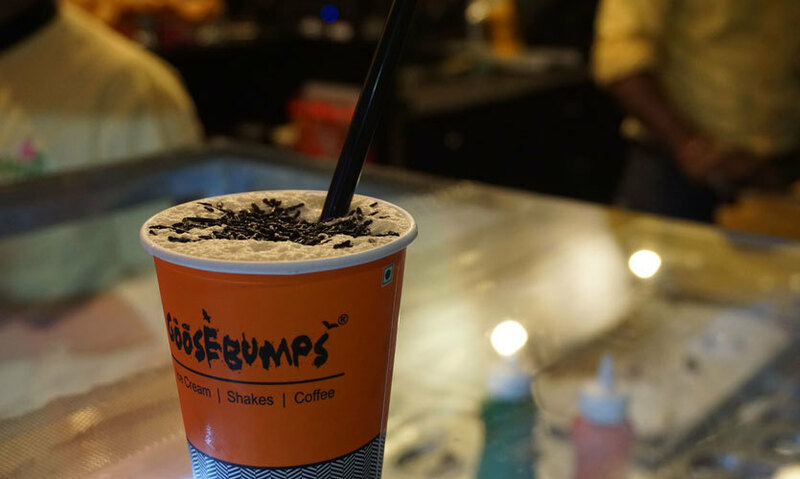 Goosebumps not only offers shakes and cold coffee, but a pretty decent range of coffees, both hot and cold. We had their Hazelnut Cold Coffee, because, well, why not! As expected, the coffee with an aftertaste of hazelnut was the perfect beverage to down after all that ice cream. Intrigued by the name, curiosity instantly made us order their Classic 80s Shake. Made with Oreo cookie crumbles, molten chocolate and caramel, the Classic 80s Shake is their combination of all other shakes. Originally a confectionery, Goosebumps has just recently started to serve pizzas as well and plans to extend the menu further. It’s amazing to see that they’ve put in a lot of thought in the entire design of their outlet and that’s what sets them apart from all other dessert parlours. Not to mention, the place seems quite reasonable compared to what all they have to offer, both in terms of quality and quantity. 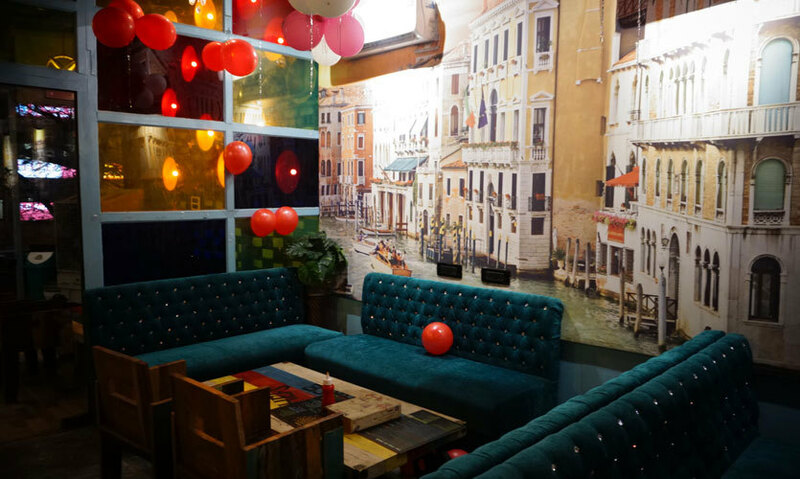 The whole ambience of the place feels really fun and sassy with more than ample seating space of two full floors. Come on by!